According to the Greek myth, Niobe – who was daughter of Tantalus and wife of Amphion, Thebes king – had fourteen children, seven girls and seven boys. She was so proud of her own offspring, that she dared laugh goddess Latona, who had only two children, the gods Apollo and Artemis. To punish Niobe’s pride, Latona sent her own two sons, charged to kille Niobe’s children. With bows and arrows, Artemis aimed to females and Apollo to males. According to some versions, they killed them all, according to others, a child and a young girl managed to escape. The Roman poet Ovid said that terror turned Niobe into a marble block, and her tears of pain gave life to a source, on Sipylus mountain, in Lydia. The clear educational purpose of the myth – warning against damages of pride – made it subject of many artistic and literary representations. The Uffizi houses a group of twelve ancient sculptures, Roman copies from an original Greek, of which we know neither the date nor the location. The sculptures that give name to the great Niobe’s Room – at the second floor of the gallery – were found in Rome, near Porta San Giovanni, in 1583. The Cardinal Ferdinando de \'Medici, the future Grand Duke of Tuscany, bought her immediately, for its Roman villa. 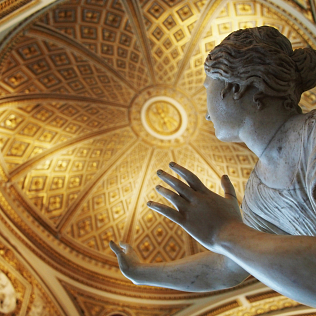 Around 1770, the sculptures were brought to Florence. In 1780, at the peak of Neoclassical period – when an important air of artistic renewal was breathed in Florence – the room where they are still exposed was set up by the architect Gaspare Maria Paoletti. The statues are lined up along the walls, spaced apart to allow visitors to admire them in isolation, sacrificing part of the relationships between the various works. The twelve sculptures represent characters fleeing or shot dead in dramatic and theatrical way. The focus of the group is Niobe, who tries to protect her youngest daughter, and directs her terrified and pleading gaze skyward. In 2013 the hall has undergone an important restoration, which consolidated the arches of the ceiling. Today, visitors can admire gilded stucco and light marbles of the floor that highlight the strong natural light, entering through the large windows that overlook Via Lambertesca.